You are currently browsing the Our philosophy category. In our shop, we resist the trends that come and go. Recently it has been imitation antiques which became popular, using glazes and distressing techniques to give “character” to woodwork, cabinetry and furniture that otherwise would be exposed for its lack of quality in materials and workmanship. We study joinery from the past that has worked for generations and combine it with the finest materials we can find. We try to stay in a timeless, Classic approach, relying on the quality of the craftsmanship and materials to provide the character. Fashions come and go, and the latest trends soon fade in popularity. Who would not prefer the timelessly soft hand of silk or the heft and warmth of a fine alpaca wool over the “qualities” of, say, the polyesters of the 1960’s and ’70’s? Why invest in something that will need to be replaced or remodeled in ten or twenty years because it is hopelessly outdated? We are building heirlooms that will last for generations. If you have an appreciation for quality and craftsmanship and don’t need artificial “character” we can provide the woodwork that will satisfy your needs and your eye for years to come. Posted 9 years, 6 months ago at 7:43 pm. Book matching boards means taking two boards sawn sequentially from a tree and opening them up similar to opening a book. This yields a matched pair of boards that can make excellent looking wider panels or a wide tabletop. 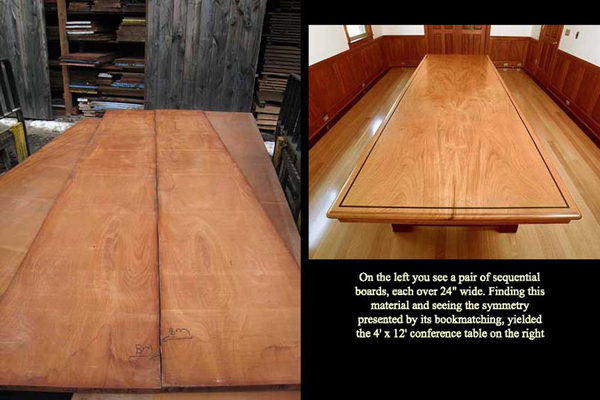 Here is an example, first in the rough boards, then in a finished 4′ x 12′ conference tabletop. We look for sequential boards in all the panel material we purchase and make an effort to purchase sets of boards from the same log, specifically book matched sets. We believe that seeing the symmetry in a book match reinforces the grain and beauty in the wood, making it more than the sum of its parts. The echo of shape, color and form serves to make a stronger statement than either board could do on its own. Posted 10 years, 1 month ago at 9:59 pm. Corlis Design has been in existence since 1983 as a custom design / build firm specializing in woodwork. With a background in both architecture and construction, I have always admired the work of Charles and Henry Greene and the Hall Brothers. As much as any team of designers and builders, these men teamed up a hundred years ago to bring the best out in each other and raise the bar in architecture and specifically, the use of wood in the built environment. Their work has inspired generations of woodworkers since and we are proud to call them an inspiration. Our work is also inspired by world class material from some of the best sources developed in our 25+ years of experience. People like Lou Irion at Irion Lumber in Wellsboro, Pa. have lived their entire life honing the ability to find the finest lumber in the land. Once we have the right material, the rest is relatively simple, honor the wood and let the material make the statement. We prefer to never stain, knowing that there are enough authentic colors in the wood kingdom that usually one can find the appropriate wood without trying to make it something it isn’t . We also try to stay away from trendy finishes and seek authentic, timeless methods that should not go in and out of style. A naturally finished beautiful piece of figured wood has an incredible tonal range and unique color and look. Stain compromises this beauty as it introduces a monochromatic mask to the native beauty inherent in the wood. We seek out wood in sets, buying material from the same log for consistency of color and figure. We are always on the lookout for unique “may not see it again” finds and matched sets of sequential boards. This allows us to make a study or a kitchen all flow with one cohesive look. No mismatched grain or color. This is not an easy feat, as most lumber is separated at the sawing stage, but it is a journey we are committed to and believe in. Once we began to work in this manner, we didn’t want to have to go back. Posted 10 years, 2 months ago at 1:24 pm. Corlis Design & Construction, Inc.